Since the 2015 legislative session ended in July, I have been hard at work in the 26th District – meeting with constituents, touring schools and businesses, and working with our community to develop policies to benefit our region. Though we have a part-time legislature, I have made serving you a full-time job. As we approach the holidays and 2016 legislative session, please take a moment to review some of the issues facing our district. As you are probably now aware, I have been on the frontlines defending liberty in our community and have stood shoulder to shoulder with wrongly suspended Bremerton High School coach Joe Kennedy. Coach Kennedy has come under attack in recent weeks for exercising his 1st Amendment right to freely practice his faith. He has been prohibited from continuing his years-long tradition of praying silently at mid-field after football games – not unlike the daily prayer we participate in when the Legislature is in session. Students, after having left the field, have voluntarily chosen to join coach Kennedy, creating a tradition that has been a source of inspiration for students from all faiths and walks of life. I stand in strong defense of his actions because they are legal and within his constitutional rights. It's also worth noting that if he was of a different faith, I'd be standing up for his 1st amendment right, as well. Joe Kennedy, a Marine Corps veteran, models the qualities of a strong leader, good coach, and great man. I, along with Rep. Michelle Caldier, have reached out to the school district multiple times and offered to help find a solution to this issue, but have been met with silence. This is disappointing and the students, faculty, and community deserve better. That is why I am planning to introduce legislation in 2016 to protect the 1st Amendment rights of students, employees, schools districts, and school volunteers, by providing litigation immunity in such cases. Truth be told, this should have been a “move along, there is nothing to see here” scenario. Coach Kennedy is a man who works a normal nine-to-five job yet has chosen to volunteer his time at a school further from his family and home so he may serve low-income and at-risk young men. This is exactly the type of volunteerism we should be supporting! Stay tuned, more to come. Last month, I was named 'Legislator of the Year' by the Great Northwest Chapter of Washington Area Vocational Administrators (WAVA) – a professional association of career and technical education (CTE) directors. 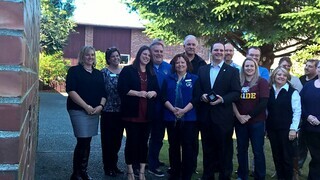 It was an honor to receive the award and meet with the directors in Bremerton. The Great Northwest Chapter of WAVA is comprised of school districts from Peninsula to North Kitsap and into Jefferson and Clallam counties. As a long-time supporter of career and technical education, it was especially humbling to receive this award from a group of educators whom I have built a strong working relationship. Supporting a robust CTE curriculum and preserving these opportunities for students is paramount to growing our economy. My work in the IT sector proves it is no longer good enough to teach students to code with blinders on. We need a comprehensive approach to educating students that fosters their innovative spirit, and provides them with the flexibility and skills to compete for jobs of the 21st century. We help achieve this by better integrating CTE and STEM opportunities across the state. There are nearly 200 students from our area who participate in the Navy JROTC at South Kitsap High School. These students are shining examples of academic excellence and community service. The JROTC program has been exceptionally successful at recruiting talented young men and women for the United States military, and has provided a model for private sector corporations to help prepare students for jobs of the 21st century. I am actively preparing legislation to allow private companies to implement a similar program for students to learn the STEM skills they need to succeed in tomorrow's workforce. Students will make a commitment to the company, thus encouraging homegrown jobs in the private sector while giving the companies an opportunity to train them according to their standards. We must continue to look for opportunities to bring both educators and leaders in the private sector together to work on this important issue. Since taking office, I have worked tirelessly to solve the issues surrounding the tolls and debt on the Tacoma Narrows Bridge. The bridge is used by thousands of people each day as they get to and from work, school and community activities at a considerable cost. My concern is these toll hikes disproportionately affect lower-income commuters who can least afford it yet the Washington State Transportation Commission (a body of un-elected officials appointed by the governor) doesn't seem to care and has simply adopted an attitude that such increases are the status quo. What's worse is two separate financial bills I introduced in January could have halted the toll increases both this year and next, but both were “killed” by the majority party because I wouldn't vote to raise the gas tax. Political game-playing like this needs to stop and Seattle's thirst for our tax dollars shouldn't halt good legislation from moving forward. We can do better, which is why earlier this year I introduced House Bill 2052, a bipartisan solution to the tolling issue that would benefit toll payers and WSDOT. This bill would provide authorization to the tolling division of WSDOT to explore the use of a public-private partnership for toll collection on the bridge. My hope is we consider partnering with companies like Starbucks, McDonald's and others who could provide a service to bridge users and create a unique and innovative opportunity that could redefine how we pay for transportation projects. Imagine a scenario where, instead of paying people to work the toll booths (a cost of $6 million annually), companies paid the state to run those booths for us while providing a service to commuters. The potential revenue generated and used to pay off the bridge would be tremendous. This bill remains a priority heading into the 2016 legislative session. I appreciate you taking the time to read my update. There is a lot of work to do to get Washington moving in the right direction and I believe we can best do this by working together. Please share your thoughts, comments and questions with me. I am always happy to be of assistance.